The LED Scrolling Message Displays are an effective way to reach out to the public for any kind of message, information or advertisement. These are available for both outdoor and indoor application. 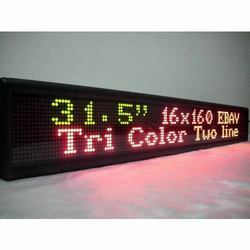 Featuring remote controlled or computerized data changing facility, these LED scrolling messages can be widely seen in stadiums, sports bar, market area etc. 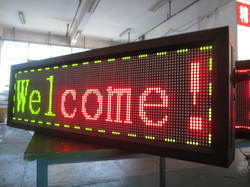 The LED Moving Message Display which can be displayed both indoors as well as outdoors, are becoming very popular these days for information transmission to a large group of people in a very short frame of time. Available in day and night visibility with RGB colors, these are computerised and remote controlled operation makes it very hassle free to operate. LED Display made with Best Quality enclosure and Super Bright LEDs. LED displays are used to display any pictures, Logos, Clock, Date Time, Temperature, Any Message for Brand Promotions etc..
All Our Products comes with 2 years warranty.